2009 Update: I am really happy to announce Long Hair Revolution (長毛革命), my first documentary, has been added to the federal government “Library and Archives Canada” permanent collection in Ottawa (click here for more info). 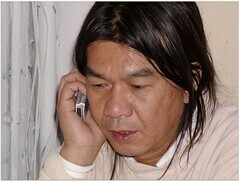 Long Hair Revolution (長毛革命) (71 minutes, 2005) (imdb) was my first documentary and you can watch it right on YouTube. In the film, I tried to “find” and understand the activist Leung Kwok-hung (nickname “Long Hair”) behind his Hong Kong Legislative Council member and rebel persona. I am honoured that my first attempt in filmmaking was accepted by the 2005 Calgary International Film Festival and I also received some post-production funding from the wonderful Academy Awards winning National Film Board of Canada. I hope you will enjoy Long Hair Revolution (長毛革命) on YouTube. This entry was posted on Monday, April 16th, 2007 at 3:28 PM and is filed under Calgary, Calgary International Film Festival, Canada, China, CIFF, Democracy, Documentary, drama, Google Video, Hong Kong, Movies. You can follow any responses to this entry through the RSS 2.0 feed. Both comments and pings are currently closed. I saw him on campus yesterday. If wasn’t for the video, I would not know who he was. Thank u! BTW, I LOVE Gilmore Girls, too! Which campus are you referring to ? On that note, which country are you in? By the way, if you enjoy the Long Hair documentary, please let your friends and classmates know about it. Yeah, Gilmore Girls is one of my most beloved TV show. Great stuff. I will miss them so very much if and when the series ends. I love all of the main characters and most of the other characters as well. I m from Malaysia. I love my country, but there are a lot of unfairness there. I hope someone or even you Kempton, would do a documentary about Malaysia’s government. The biggest problem in Malaysia is race is always the issue but, IT IS NOT. All we want is a fair law and bring equality to everyone. Thank you so much for your kind words. I don’t know the people, culture, and politics of Malaysia well enough at the moment to do a documentary. Now, why don’t you give it a shot and make a documentary (or a short documentary) about the Malaysia that you love and know (the goods and the bads). The cameras are cheap and software are very reasonably priced (I recommend Final Cut Pro). Now, if you can’t afford FCP, simply go with iMovie, never let anything (including the tools) stop you from making films. Nice to hear from u Kempton. I love this documentrary very much and i admire Long Hair a lot too. Long hair’s revolution has really give me hope about freedom in my country. I m chinese by the way. Malaysia is very different from Hong Kong. In Hong Kong, Chinese is the majority but in Malaysia Malay is majority, there are also Indians. If the chinese or indian oppose the governmet (which are mostly Malay) they will say we are racist. Nothing is worst than a race between war. But on the other hand, the minorities are marginalised. It doesn’t matter who the becomes the leader, all we are hoping is more equality. But to bad i m now on America pursuing my degree. Even if i m in Malaysia, i do not have the experience of doing a documentary. Then again, thank you Kempton. PS: If u see see Long Hair again, send my regards. Malaysia say hi to Long Hair. Long Hair is a very special man. It is with his dogged devotion and determination that he managed to do things that many others had considered impossible. There are many minorities being marginalized in the world and it is not an easy task to convince the majority to treat the less powerful group with equal respect but try you should. Try you should. Watch the RTHK program Defending Justice in China – part 1 and 2 if you can find sometime. These Chinese lawyers were doing the impossible and, at times, risking their personal safety to do so. I admire them very much. In a sense, do what you can, and within the law and try to change the system from within, one small step at a time. Will pass along your hello next time I go to Hong Kong and see him. Best of luck to your studies and the situation in Malaysia. I came from 周游。列國’s blog and surprised to find out that you are the film maker of this documentary! Once my husband found this documentary in google and introduced this documentary to me and we watched it together. We enjoyed it much as it reveals more about Mr Long Hair to the public. Thanks for the video! Good day! Good to see readers of 周游 dropping by to say hi. I wanted people to understand Long Hair for more than his public persona and I am glad to hear you and your husband enjoyed Long Hair Revolution and found you learned a little bit more about Long Hair from my film.